I’m a big fan of Tokyoflash – their watch designs might at times confuse, but they’re always interesting and occasionally worthy of purchase – as is the case with this Retrofit watch. Available in Cylon Silver, Gun Metal or Galactic Gold with a choice of green or red LED, the display is angled so it’s easy to check at all times. 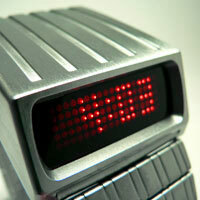 A press of the button activates the LED matrix, which animates across the screen to reveal the time, a second press shows the date. And it’s heavy – so you feel you’ve got a lot of watch on your wrist for the price of around £70. It’s probably the most basic watch that Tokyoflasdh produces. I really recommend checking out their past watches in the Watch Museum section. If you have the time to decipher the LEDs, there’s more stylish pieces to be picked up – and all at reasonable prices. their website never ever works, you have to view pages through googles cache. This means [i think] you cant order through them.